Why did Abul-Fotouh fail in the presidential elections? Why did Sabbahi - 'one of us' - do so well? Was Khaled Ali fighting a lost cause? Muslim Brotherhood presidential candidate Mohamed Morsi and last Mubarak-era prime minister Ahmed Shafiq appear to have made it to the final, two-horse race in Egypt's hotly-contested presidential elections, after coming in first and second with 5,553,097 and 5,210,978 votes respectively in the first round of balloting. The results, expected to be made official on Tuesday, leave Egypt's secular revolutionary forces in a quandary. Socialist candidate Hamdeen Sabbahi, the favoured contender among revolutionary voters, fought an impressive electoral rearguard action, finishing a not-so-distant third with 4,739,983 votes. Moderate Islamist candidate Abdel-Moneim Abul-Fotouh and former Arab League chief Amr Moussa, meanwhile, trailed behind at fourth and fifth place, respectively, with 3,936,264 and 2,407,837 votes. Votes cast for the other eight candidates – at 13,000 polling stations throughout Egypt's 27 governorates – were negligible. According to Al-Ahram's Arabic-language news website, total voter turnout for the two-day election stood at 43.4 per cent of Egypt's roughly 50 million registered voters. Many voters reportedly refrained from casting ballots in light of the fact that a new Egyptian constitution has yet to be drafted – meaning that the coming president's powers remain largely undefined until now. From 11 to 17 May, more than 314,000 Egyptian expatriates abroad cast their votes, according to Egypt's Supreme Presidential Electoral Commission (SPEC). Morsi secured the largest portion of these, but the relatively low turnout appeared to detract from the significance of the expat vote. Morsi was the last entrant into the presidential race, but managed – through extensive electoral campaigning by the Brotherhood and its Freedom and Justice Party (FJP) – to amass the largest number of votes in the first round of voting on Wednesday and Thursday. FJP Chairman Morsi, however, had not been the first choice of the Brotherhood, which – after backtracking on an earlier decision not to field a presidential candidate – unveiled Khairat El-Shater in April as its nominee for highest office. El-Shater was disqualified from the race by the SPEC a fortnight later for legal reasons, however, to be replaced by Morsi as the Brotherhood's nominee. For weeks, Morsi was described as the Brotherhood's "substitute candidate" – even derided by some critics as a "spare tire" – until he proved his detractors wrong. The 60-year-old is now considered a shoo-in for the presidency, with most expecting him to beat Shafiq handily in the runoff vote. Most if not all of Egypt's Islamist forces – which last winter won over 70 per cent of the seats in parliament – now appear set to back the Brotherhood candidate. At a Friday press conference, FJP Vice-President Essam El-Erian declared: "We're not seeking power; we just want to build this country ... We aim to provide genuine stability, not artificial stability of the kind we saw under Mubarak." Many revolutionary parties and movements also appear set to back Morsi, mainly to prevent Shafiq – who is closely associated with the ousted Mubarak regime – from winning the presidency. Revolutionary activist Alaa Abdel-Fattah, for example, declared on Twitter on Friday: "If it comes down to Morsi and Shafiq, I'll give my vote to Morsi … but I'm very worried that there's a large faction of society that will never vote for an Islamist – even if the alternative is Shafiq." Shafiq, for his part, managed to reach the runoff phase after overcoming a number of obstacles. To begin with, the People's Assembly – the lower house of Egypt's parliament – had pushed for implementation of a 'disenfranchisement law' aimed at preventing former regime figures from holding high government positions and contaminating Egypt's perceived political rebirth. The Islamist-led assembly last month endorsed the law, which was later ratified by Egypt's ruling junta. As a result, the SPEC disqualified Shafiq from the presidential contest. But the tenacious presidential hopeful got his foot back in the race after lodging an appeal with the SPEC against the decision, in which he challenged the law's constitutionality. Egypt's civil aviation minister from 2002 to 2011, Shafiq has held a host of high-level government and military positions. In the final days of the Mubarak regime last year, he was appointed prime minister in hopes of taking the wind out of the sales of the Tahrir Square uprising – albeit to no avail. During his brief stint as interim premier, Shafiq faced a firestorm of criticism over his unequivocal support for Mubarak and his antipathetic attitude to the revolution. Many critics also blame him for the infamous 'Battle of the Camel,' evidently launched by Mubarak cronies at the height of the revolution in a bid to clear Tahrir Square of anti-regime protesters and end the nascent revolt. While Shafiq was never accused of direct involvement in the incident, which saw dozens killed and injured on 2 February of last year, he was nevertheless criticised for having headed up the government at the time. Shortly after Mubarak's ouster, Shafiq was relieved of his duties and all but vanished from the political scene. The announcement of his presidential bid last December, however, marked his return to the public arena – and reignited hostility between him and Egypt's revolutionary forces, which categorically reject the notion of seeing a Mubarak-era minister assume the presidency. "Shafiq is the president who was banned, then allowed to run, then got hit by shoes, and still won," Egyptian revolutionary activist Gigi Ibrahim tweeted on Friday. On Wednesday, the first day of Egypt's presidential vote, Shafiq was attacked by members of the public who hurled stones and shoes at him after he cast his ballot at a polling station on the capital's outskirts. Those who pelted the candidate included the relatives of protesters slain in last year's uprising, many of whom carried images of their murdered loved ones. Shafiq spokesman Ahmad Sarhan, was quoted as saying that Egyptian voters had chosen his candidate because he had promised to "save Egypt from the dark forces" – a reference to the Muslim Brotherhood and more militant Islamist groups – and restore domestic security. 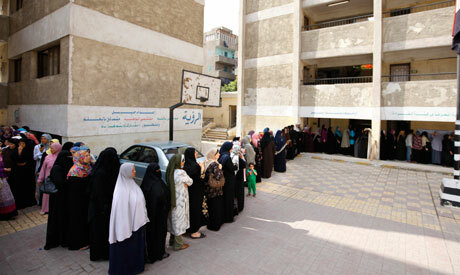 Egyptians will choose between the two candidates in a runoff vote slated for 16 and 17 June. *All vote counts mentioned in this article were culled from official sources, except those for Moussa, whose count was provided by official state news agency MENA. why not a tv debate betwen the two?? Shafiq has to make it clear, what he think about Mubarak 30 years??? God have Mercy not Morsy on Egypt. What happened in Egypt? Where is a new resurrected Gamal Abdel Nasser. May God have Mercy, not Morsy upon us. to call Mubarak and order him to quit. The western world will miss Mubark. He was a moderate leader, as opposed to Ahmadinejad and Assad. you have the choice to drive off the cliff or into the wall. before the choice was to follow and be silent ! If Murshi wins, conflict between Islamists and Miitary will force these to follow development agenda as these can not agree for other things and thus revolutionaries will have a chance to review revolution. You don't like Morsi because of his Looks???? So you want to decide the next president based on looks??? You're not attracted to Morsy so you'll vote for Darth Vader? Keep in mind that Shafiq has the Military and Police at his back, and they are ready for round 2. Letting Shafiq win is means you probably won't get another fair oppertunity to vote in a Liberal. You'll be stuck with Shafiq till he dies then you will get his son. Shafiq is Mubarak. The fact is the the country is a mess and 4-5 years is not enough to fix it and with the Ikhwan in parliment and presidency they won't be able to escape blame. Liberals will have a chance to regroup, set the agenda for next elections and seize power. Going for Morsy instead of Mubarak2 and his Central Security Forces is a NO Brainer! Wake up to the realities! Morsi and the Muslim Brotherhood are fascists. Political Islam is fascist. Voting for the Islamists is like voting for Hitler in 1933. Not a good idea for 2012. I agree with you, Morsi is a disgrace, the furthest he's probably going to get is carrying shafiq's bag, long live Egypt.